I am Cat over at Fox in the Pine and am thrilled to be guest posting today! I love this time of year because I can make fresh pesto. But, because basil can be pricey, I find that I don't make it as much as I'd like. Even growing my own basil, I find that I never have enough to satiate my hunger for this delicacy. To remedy this, I use stinging nettle leaves instead of basil for our pesto. You can exclusively use stinging nettles, or you can mix the two (stinging nettle and basil) so that you can make a larger batch. Nettle can also be a great substitute for cooked spinach in foods like ravioli, gnocchi or omelettes. 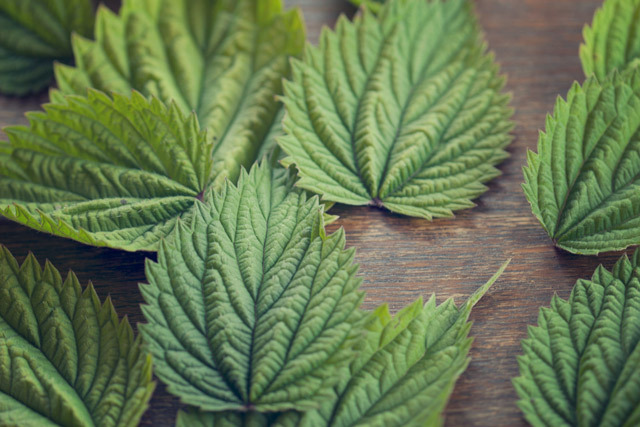 Stinging nettle is an amazing multi-vitamin and is mineral rich, providing Vitamins A, B, C, E & K along with minerals like iron, calcium, potassium, silicic acid, manganese and copper. It stimulates kidney excretions making it the perfect detoxifying tonic and is also amazingly helpful for skin conditions such as eczema and can re-stimulate hair follicles on your head and get rid of dandruff. It is known to help relieve premenstrual symptoms and also counter arthritis, rheumatism, tendonitis and other disorders of the muscles and joints. It will also increase milk production in lactating women. I could go on, but the list is LITERALLY unending. You are probably wondering why this magic leaf is not in everything we eat. This is because the plant protects itself with little stinging hairs that cover its stems and leaves. For this reason, nettles must be picked with thick gloves and put straight into a bag. You should also make sure that your arms and legs are well-covered as you might accidentally brush up against a plant with your legs. 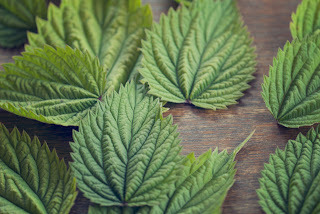 Nettle leaves can also be purchased at your local farmer's market, but in the Northwest nettle grows any place that is not regularly gardened. Look for nettles well-away from roadsides (where they are at risk of being sprayed by chemicals or otherwise contaminated by car emissions). Nettles thrive in the same conditions as blackberries and can often be found competing with them for territory. 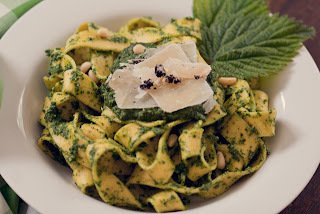 To make nettle pesto, you can use your own pesto recipe and just replace the amount of basil leaves with nettle leaves. Or, you can use the recipe below. Since it is difficult to accurately measure the amount of nettle leaves used, the amount of ingredients may need to be tweaked with each batch. The nettle leaves must be blanched in order to get rid of the sting to render them safe to touch and eat. First, wash the leaves in a strainer or in your sink. Then, transfer the washed leaves from the sink to a large pot. Add just enough water to cover and bring to a light simmer and blanch the leaves for 10 minutes. Once done, drain them in a colander and put these cooked leaves into a food processor (or a blender). Add the pine nuts, grated cheese, and chopped garlic and blend these ingredients together. Add salt and pepper to taste. Depending on the amount of leaves used, and the amount of water left in and on the leaves, you may have to tweak some of the ingredients bit-by-bit to perfect your batch of nettle pesto. If you want a creamier recipe, with butter and cream, follow this link (and remember, just replace the amount of basil with nettle). Enjoy this healthy and delicious, foraged find! Note: If you do get stung, don't panic! The hairs contain formic acid, serotonin and histamine. So it is a little painful and a little itchy, but this all can be remedied by making a paste with some baking soda and a tiny bit of water. Put the paste where you have been stung and you will feel instant relief. If you don't have baking soda, aloe vera will work as well.